John F. Goodman as a LtGen. Lieutenant General John Floyd Goodman (born November 5, 1945) is a retired United States Marine Corps general. John Goodman was born and raised in Sacramento, California. He played football, basketball, and baseball while attending Encina High School. As the varsity quarterback, he earned All Conference, All City, All Sacramento County, and All Superior California honors his Senior year. Goodman graduated in 1963. Goodman was also selected to the Sacramento All City and All County baseball teams. He then attended Arizona State University. Goodman was the Sun Devil starting quarterback in 1965 and 1966 leading the team in total offense both years. He earned a Bachelor of Science in Business Administration from the university. Goodman began his military service in 1967 with the United States Army. His first combat tour was in the Republic of Vietnam as a member of a Long Range Reconnaissance Patrol team. He earned a Bronze Star with "V" Device, the Soldier's Medal, and the Purple Heart while in Vietnam. He transferred to the inactive Army Reserve in 1969. Goodman played professional football for the New Orleans Saints very briefly prior to entering the United States Marine Corps in 1971. Following his commissioning in December 1971, Goodman became a Naval Aviator in May 1973 at Naval Air Station Meridian, and was assigned to Marine Corps Air Station Yuma, where he completed flight training in the A-4 Skyhawk. In November 1973 he was assigned to Marine Attack Squadron 223. He later served as a Forward Air Controller with 3rd Battalion 6th Marines at Camp Lejuene. He graduated from the Marine Corps Weapons and Tactics Instructor School, the United States Air Force Weapons School, and United States Navy Fighter Weapons School (also known as TOPGUN). In 1979, he transferred to MAWTS-1 as an instructor and the A-4 Department Head. After graduating with honors from Marine Corps Command and Staff College, Goodman reported to Marine Corps Air Station El Toro, and he served as the Operations Officer for VMA-214; and later as the Director of Safety, Standardization, and Tactics for Marine Aircraft Group 13. From 1985 to 1986, Goodman was the Assistant Division Air Officer for 3d Marine Division, then returned to El Toro after conversion training to the F/A-18 Hornet. After serving as the Executive Officer of the VMFA-531, the Assistant Group Operations Officer for Marine Combat Crew Readiness Training Group 10, and the Group Operations Officer for Marine Aircraft Group 11, he assumed command of VMFA-531 on 28 October. In June 1990, he went to Marine Corps Base Quantico, as a member of the first class of the Marine Corps War College. During the academic year, he served as the Air Plans Officer for I Marine Expeditionary Force in Kuwait for the Gulf War. Following end of hostilities, he completed War College and was assigned as the Director of the School of Advanced Warfighting. 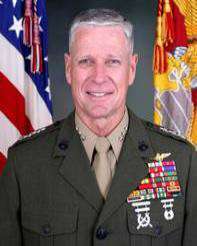 In July 1993, Goodman assumed command of Marine Aircraft Group 41 at Naval Air Station Dallas. In July 1995, he returned to Quantico as the Deputy Director of the MAGTF Staff Training Program. Promoted to Brigadier General on May 1997, he assumed the position of Director, Strategy, Policy and Plans (J5) of United States Southern Command in June 1997, becoming the Chief of Staff in May 1998. In July 1999, he returned to Quantico as the Director, Warfighting Development Integration Division. He was frocked to Major General in June 2001 and took command of the 2nd Marine Expeditionary Brigade on 6 July 2001. From 5 August 2002 until 3 June 2004, he commanded the 1st Marine Aircraft Wing at Okinawa. Goodman also served as the Commander, Marine Forces Korea and Assistant Chief of Staff, U/C/J-5, United Nations Command, Combined Forces Command, and United States Forces Korea from 4 June 2004 until 17 June 2005. On 20 June 2005, he reported for duty as Deputy Commander, and later as the Commander of, Marine Forces Pacific. Goodman logged more than 4100 hours in tactical jet aircraft while in the Marine Corps. In 2008, after Cyclone Nargis ravaged Burma, Goodman commanded U.S. Joint Task Force Caring Response. Goodman, on numerous occasions, offered Burma’s military government the use of helicopters and surface craft to support humanitarian relief efforts in the most difficult-to-reach areas of the Irrawaddy Delta. The U.S. flew more than 116 flights, delivering more than 2.2 million pounds of needed relief supplies to the Rangoon hub. As MARFORPAC commander, Goodman also led the development of U.S. Pacific Command’s Consequence Support Force 503 functional plan to address the United States’ military response to the threat of an Avian Influenza Pandemic outbreak in the Asia-Pacific region. On September 25, 2007, Goodman conducted the promotion ceremony for Jim Nabors at Fort DeRussy in Honolulu, Hawaii. Nabors, who played PFC Gomer Pyle on a TV show of the same name, was promoted to Honorary Corporal in the United States Marine Corps based on his outstanding contributions to the Marine Corps and the United States. On October 17, 2008, Goodman became the Director of US Department of Defense's Center for Excellence in Disaster Management and Humanitarian Assistance. Goodman participated in the 994th Wilton Park Conference, "The Use of Military Assets in the Humanitarian Response to Natural Disasters" held 28–30 September in West Sussex, United Kingdom. General Goodman chaired the sessions focusing on the strategic importance of collaborative partnerships. General Goodman served as the Chairman of the Board of Advisors for Tactical Edge from 2012 through 2014. He currently is an Advisor and Subject Matter Expert with the US Special Inspector General for Afghanistan Reconstruction. On October 29, 2010, Goodman was honored, along with all Sun Devil Quarterbacks, at a Legends Luncheon hosted by the Arizona State University Alumni Association and Sun Devil Club. Other honorees included Danny White, Andrew Walter, Jake Plummer, and Jeff van Raaphorst. On April 29, 2011, Goodman was the 1st inductee into the Encina High School Hall of Fame. Goodman was inducted into the San Juan School District Hall of Fame on November 1, 2013. On November 20, 2015, Goodman was highlighted as part of the Pac-12 Conference's Centennial celebration. The Conference highlighted 100 Pac-12 student-athlete alumni who have had tremendous success off the field of play—in their careers and in their communities. ↑ "Encina Yearbook 1963". Encina High School. Retrieved 2009-12-04. 1 2 Cole, William (August 23, 2008). "New commander for Marine Forces Pacific". The Honolulu Advertiser. MarineCorpsTimes.com. Retrieved 2008-08-23. ↑ "Lieutenant General John F. Goodman". USMC. Retrieved 2009-11-02. ↑ "Assets Still Available for Distribution, General Says". American Forces Press Service. Retrieved 2009-11-02. ↑ "Surprise, surprise, surprise! Jim Nabors promoted". Jim Nabors.com. Retrieved 2009-10-06. ↑ "COE attends the 994th Wilton Park Conference" (PDF). COE. Retrieved 2009-11-02. Wikimedia Commons has media related to John F. Goodman.